Life Imitating Art Imitating Life? Terrorist Acts Portrayed in 2001 Green Lantern BEFORE 9/11. Jade comforts Kyle on the planet Tendax after a terrorist attack. 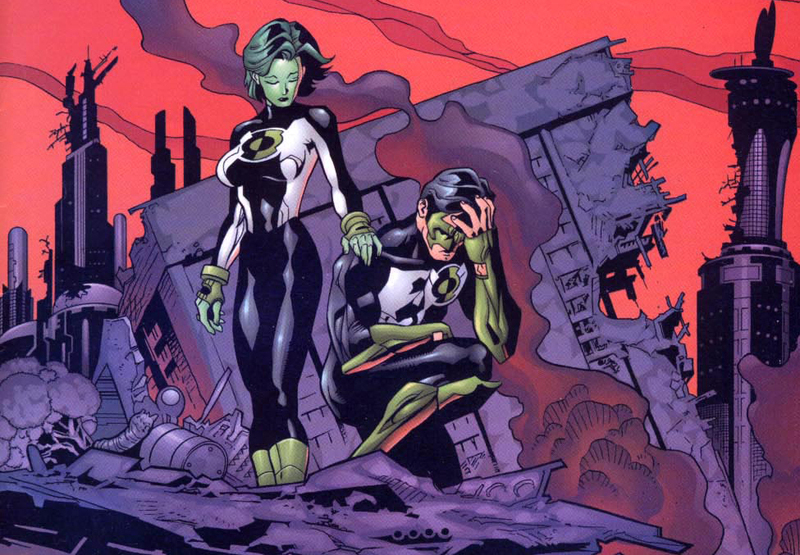 *WARNING* The following entry talks about depictions of terrorist attacks in the comic book series Green Lantern. Reader discretion is advised. As you may remember, I have charged myself with the task of owning every single issue of Green Lantern ever printed (every issue, not every copy). Not only am I collecting them, but, I am also making it a point to read each and every issue I get. Print is meant to be read! This has become like looking into a time capsule to the past. Reading how certain words are phrased and seeing certain things drawn into the background has brought back memories of old! Especially the advertisements! But, that is not what I would like to talk about. What I would like to talk about is 9/11.